Finn Kincaid is cursed. Literally. Accused of murdering his pack-brother, beaten, and left for dead in the woods, he runs to Nocturne Falls to seek sanctuary with the one cousin who successfully got out of Tennessee: Ivy Merrow, the sheriff's wife. On his way there, he's drawn off course by a girl with no idea how much power she possesses, both within herself and over him. Together, Kai and Finn must find a way to break the curse and fight their fate, without destroying each other - and their future - in the process. Kristen has chosen an excellent writer to extend her NF world! Sadly, it seems this is the only one in audio so far. However, this story is a complete delight. The characters are well defined and perfectly true to Kristen's own wonderfully imaginative world. The plot line, also, smacks of the other Nocturne Falls stories with only a slight hint of its own brain behind it. I have all of Kristen's books and have been hungry for more. I so look forward to more of these delightful stories in audio, as I have difficulty reading. Probably just aged eyes, but, nonetheless, most of the books I buy now are from Audible. I highly enjoyed this Nocturne Falls addition. I'm glad Kristian Painter decided to give new authors a chance. Alethea Kontis did a wonderful job of writing this addition, I hope to read/listen to more of her work. I highly recommend this story, especially to those who are fans of Kristen Painter. I wish I hadn't waited so long to venture into the Nocturne Falls &quot;Universe.&quot; I couldn't see how anyone else could do justice to the world that Kristen Painter created. I was pleasantly surprised and thrilled to be wrong! The fact that B.J. Harrison is narrating the &quot;Universe&quot; stories adds to the authenticity of the story. It was perfect to hear Hank, Bridgett, Delany, and so many other voices again. The writing was no let down either. I felt truly, flawlessly, and authentically immersed in Nocturne Falls, just as if Kristen Painter had written it herself. 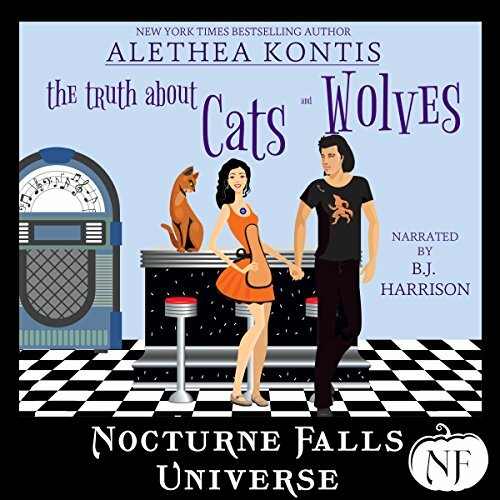 Bravo to Alethea Kontis for providing Nocturne Falls Fans such a great read! This Greek girl also enjoyed reminders of being called koukla by her YiaYia and the love of Greek Mythology. An excellent addition to the Nocturne Falls Universe, a place where it is Halloween every day, and the supernaturals are hiding in plain sight. This couple is on the younger side and each has some hurdles to overcome. The publisher's blurb gives clues but can't begin to prepare you for all the laughs and angst. No spoilers here, just go ahead and enjoy! Delighted to find the audiobook on sale, and B.J. Harrison gives his usual delight performance as narrator! I LOVE THIS BOOK!! SO MUCH FUN!! REALLY ENJOYED THE TIME AND ALWAYS ENJOY LISTENING TO B.J. HARRISON! A great story about friendship and love. I really emjoyed this story because the characters were relatable and the situations that Kai and her friends get into are heart warming and enjoyable. I like the way the characters learned more about themselves and each other by working together. Winner! Will be a repeat listen. An amazing book full of fun and very light read Great book for someone looking a Romance with a little bit of mystery. This was a series I came to not initially via the author but thru the narrator. Than the shift to the plethora of different authors came to be...I got skeptical of quality vs the greed for quantity.. This NF Univ. put that thought to rest & found myself elated by the thought of more. Thanks to K. Painter & Alethea Kontis for making me a believer. I own btwn 1500 & 2000 books in all formats didn't think I could be so joyful over a new knowledge... then I looked at my library and laughed that this is the exact reason I had so many.